September 2017: The Tukwila Planning Commission has reviewed preliminary work on implementing the CNU recommendations. 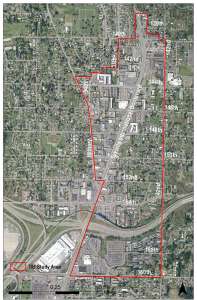 A draft Zoning Map and Land Use Table were discussed at an August Work Session. The City is now focused on evaluating the cost, options and impacts for the redesign of Tukwila International Boulevard per the design in the CNU report. Final design and restriping timing will determine the next steps for the development standards for the area. Stay tuned and stay involved. May 2017: The final report is here! Take a look at CNU’s recommendations. Susan Henderson of Placemakers, the lead author in the report made a presentation to the City Council on May 1, 2017. Watch a recording of that presentation. Next steps – analyze the traffic impacts of the proposed street redesign and report findings to the City Council. What: The City of Tukwila adopted the Tukwila International Boulevard District Element of the Comprehensive Plan in 2015. Now in 2017, the Congress for New Urbanism is partnering with the City of Tukwila to assist in an implementation plan for the neighborhood. During the weekend of February 23-25, your vision and goals were reviewed, your comments regarding opportunities and constraints around implementation were collected, and draft recommendations were developed. A final report is now scheduled to be presented at the regularly scheduled City Council meeting on May 1st, 2017. 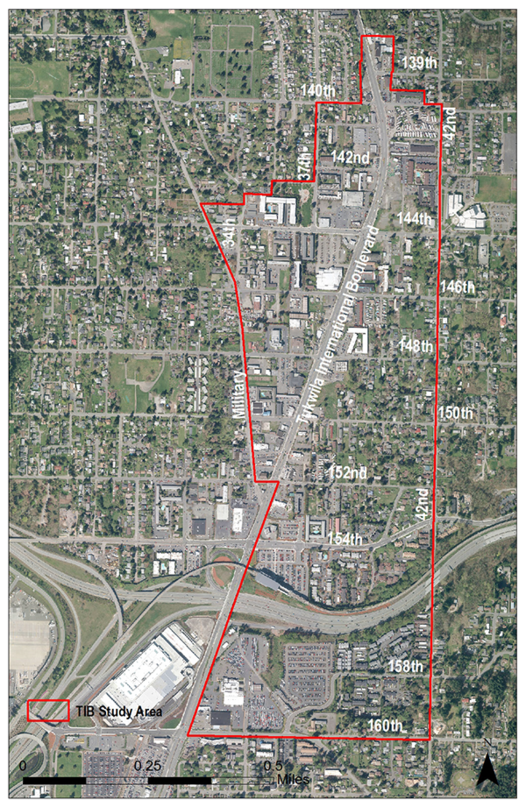 Where: TIB Rising focuses on the Tukwila International Boulevard neighborhood from S 139th St. to S 160th St.
Who: See the team of consultants from the Congress for New Urbanism who are working on this project. When: This fall we will begin working will local residents, businesses, service providers, and other stakeholders in implementing the community’s vision for the neighborhood. An area that is a complete neighborhood with thriving, multicultural residential and business communities with vibrant places where everyone can live, work, shop and play. The area is a safe and walkable destination with an authentic main street that is connected to other destinations. There is an emphasis on self-sustaining, living wage employment opportunities here. Reconfigure TIB into a street that connects the east and west sides through more protected crossings, that contains on-street parking, and is known as a destination instead of just a throughway. Strengthen design guidelines so that buildings support a walkable environment and enhance overall neighborhood quality. Modify the parking requirement in order to minimize the negative impact of large empty parking lots on neighborhood quality and walkability. Develop strategies for increasing sidewalks and decreasing the size of blocks. Preserve and enhance the multicultural character of the area. Foster community engagement among residents and businesses and investment in the area thereby supporting the sense of safety and community livability. Please go to the project’s twitter hashtag #TIBRising and add your comments, or send an email to Moira Bradshaw at 206 431-3651 and at moira.bradshaw@tukwilawa.gov; or Lynn Miranda at 206 433-7162 and at lynn.miranda@tukwilawa.gov. To receive email updates and announcements of events, please leave your email or mailing contact information.